Building upon the thesis of Baden and Harwood (2013) that “terminology matters” in describing sustainability programs and corporate social responsibility reporting efforts, this chapter examines how an organization rhetorically self-defines its specific degree or level of “responsibility” in a particular industry or within an industry sector in its actions as well as its non-financial reporting efforts. Starbucks's evolution in developing sustainability programs and their sustainability reporting over a 12-year period are examined as a case example. Being both praised and criticized, Starbucks provides an instructive example of the evolution of corporate responsibility in a customer-facing enterprise. A model of both internal and external drivers of corporate social responsibility and sustainability progress is proposed and applied to the Starbucks case. Each company self-defines its responsibility to society through the process of creating corporate social responsibility, citizenship, or sustainability programs and charitable giving practices. In fact, the concepts of sustainability and corporate social responsibility (CSR) are said to have already become embedded within a critical mass of organizations around the globe (Ciliberti, Baden, & Harwood, 2009). To support these practices, frameworks for sustainability and non-financial reporting have been established and are being used extensively by corporations in different industries. The Global Reporting Initiative (GRI) has, moreover, actively promoted sustainability and CSR reporting as a valuable step in better understanding a firm’s social, environmental and economic responsibility and its associated impacts. The GRI reporting process has been developed and is now advanced to a new iteration known as the G4 that was launched in May 2013. The reporting process is now well established. 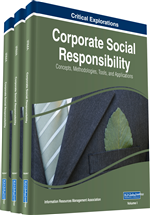 Studies indicate that 91 percent of all U.S.-based businesses report formal CSR policies (see Lacy & Kennett-Hensel, 2010). According to the 2011 KPMG International Survey of Corporate Responsibility Reporting (KPMG, 2011), 95 percent of Fortune Global 250 (G250) companies now disclose social and environmental information either in a standalone format or as an integrated report. This compares to just 35 percent of G250 companies undertaking environmental reporting in 1999 (KPMG International Survey of Corporate Responsibility Reporting, 1999). In short, GRI Reporting has been established globally as a positive effort at transparency, even if it may have been initially merely a self-serving activity that touted a firm’s corporate philanthropy. With vastly more widespread reporting efforts, sustainability and CSR reporting now appears to have become much more of a peer-driven process. While gathering environmental, social, and governance (or “ESG”) information can be a formidable challenge in many companies, it has also clearly become an important managerial process. Reporting activities, as well as regular or recurring CSR initiatives, have the potential to lead to greater levels of managerial commitment to social responsibility, sustainability and other important goals. Reporting furthers attention to externalities and the social impact of business, and this has the potential to enhance CSR practices as this corporate awareness grows. Sustainability is clearly becoming widely recognized as important; yet the ability of business to create a “sustainable global society” as a result of voluntary measures needs to be seriously scrutinized. Uniform standards of corporate citizenship behavior are not entirely clear and consistent in collectively reading these voluntary reports. The reporting process currently appears quite piecemeal and fragmented. Previous studies have analyzed the content of environmental and sustainability reports (Kolk, 1999, 2003; Kolk, Walhain, & van der Wateringen, 2001; Morhardt, Baird, & Freeman, 2002). However, the prevalence of reporting signals that attitudes and perspectives may have meaningfully changed; there has been a tipping point. The effort here is to examine the result of these efforts, namely the development of sustainability and CSR commitments as a long term and evolving management process. Reporting is viewed within a context of emerging business initiatives, changing management practices, developing technologies, and ongoing competitive challenges.